The AWS-4 is an operating in S-Band 2D surface and low level air search radar, designed late 1970s. AWS-4 utilizes a lightweight antenna and low volume transmitter making it suitable for installation aboard ships such as fast attack craft and patrol vessels. The radar provides surface and air tactical surveillance and target designation to weapons systems (surface craft detected at the horizon, others 60 NM up to 38,000 feet with 80% detection probability). 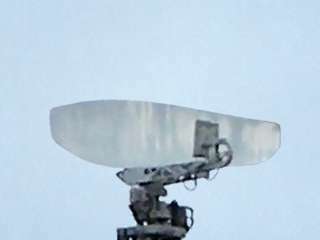 The antenna is a double curved parabolic reflector made of glass fiber reinforced plastic (GFK), galvanic coated with a thin metal layer. It provides a Cosecant squared pattern. The feed horn incorporates the radiators for the interrogator. AWS-4i is an upgrade of the AWS-4 equipment which incorporates a coherent on receive moving target indicator subsystem with automatic plot and track extraction. Its antenna provides variable polarization to overcome the effects of precipitation. The transmitter uses two types of tunable magnetrons, either in range 2.7 to 2.9 or 2.9 to 3.1 GHz.